Quote of the day | Climate Etc. Well, at present I can’t go with quote of the week, since provocative statements are flying fast and furiously in anticipation of the IPCC Report. “Barring a major volcanic eruption, most 15-year global mean surface temperature trends in the near-term future will be larger than during 1998-2012,” according to the 127-page Technical Summary dated June 7 and obtained by Reuters. Temperatures are likely be 0.3 to 0.7 degree Celsius (0.5-1.3 Fahrenheit) higher from 2016-35 than from 1986-2005, it says. The reports by the IPCC, updating an overview of climate change from 2001, are the main guide for government action. “Fifteen-year-long hiatus periods are common” in both historical records and in computer models, the technical summary says. But scientists were caught out – in one computer model, 111 of 114 estimates over-stated recent temperature rises. The drafts predict that temperatures could rise by up to 4.8C (8.5F) this century – far above a ceiling set by governments of 2C (3.6F) above pre-industrial times to avoid dangerous changes to nature and society. With deep cuts in greenhouse gas emissions, the rise could be kept to just 0.3C (0.5F), the draft says. Well, I am afraid I must conclude that the IPCC “has no idea what’s going on“. One explanation is that space aliens implanted an energy source in the deep ocean – they are storing up the energy for the trip back, but it does generate some waste heat. Jim2, that is just foolish; unicorns spear he heat with their horns and take it to the depth’s. Yes, these two things are very different. We know the answer, but we just can’t currently quite pin-point which of our frantic guesses is the actual precise right answer. Rest assured, we know the answer. We are highly paid experts. But it would be unfair to ask us which of our half-arsed speculations are actually right at the current time. Please allow us a few years to work out which of these hair-brained responses will be swallowed by the people who pay us. Beat me to it. Exactly my interpretation of the QOTD. “Fifteen-year-long hiatus periods are common” ????? I guess when models fail it’s time to move the goalposts and rewrite history. What hyphenated word appears in both the sentence before and the sentence after your extended quote? And can you document for me a 15 year trend of zero? I’ll bet you can, but here is the entirety of the next sentence from your cite. so the models have predicted pauses of decadal length so that means they haven’t failed to predict the pause, so lets get on with destroying the economy, and ushering in the new world order government already. At least they are committing to there being one and only one cause, but how do they know that? Accepting human powerlessness over nature is indeed unpalatable. I don’t think this is coincidence, stay tuned. What do you think of Andy Pitman’s article here? He is the Review Editor of Chapter 9-evaluation of climate models- WG1 of AR5. Given that the most of the melting that goes on is from the underneath (i.e. under the water) and ocean heat content is at modern highs, and the oceans have even released a bit less energy than average over the past 15 years, it is not a coincidence that ice would de line even faster during this period. Melting all that ice sucked the heat out of the atmosphere. The “curious climate-change incident” is that there *NEVER* has been a fifteen-year-long hiatus in any measure of Earth’s global energy-budget. Why is Earth’s energy-budget “dog” not “barking” decadally? Is there *ANY* scientifically credible explanation for Earth’s “dog not barking” … aside from than the consensus scientific view that “James Hansen’s 1981 climate-change views have proven to be essentially correct“? Mostly people wonder why individuals and organizations so sure that they know what is happening in the climate system are so unable to build a reliable model to forecast the future. Wow- almost makes you believe they overstate their knowledge doesn’t it???? Why is it that the people who understand Law and Order work behind bar, the people who understand politics spend their time driving cabs and the people who really understand climate science write papers about nmr spectroscopy in the far, far future? You’d have cleaned up at Jimmy the Greek’s betting the diametric opposite of the IPCC projedictions. Quite correct. Bring on some cooling to further their bewilderment. Mother Nature responds Petition denied: climate-science is affirmed. Looks like “game over” for consensus-denialism, eh J Martin? Steven Goddard has a considerable amount of documented evidence of NOAAs illicit adjustments to historic data. So I don’t put much credence in your link. But here’s some NOAA discourse for you. Well, not really, but anyhow. A NOAA prediction no less. Looks like cooling to me. @ fan…I missed where JMartin invokes “Mother Nature”. Is there some hidden information that I am not seeing? 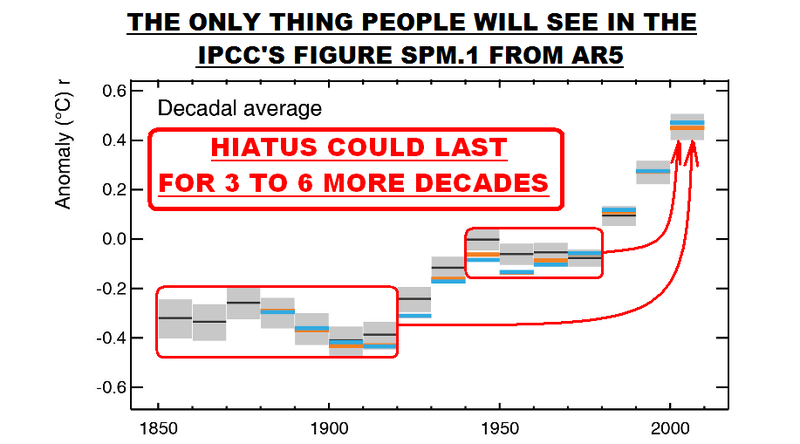 the IPCC “has no idea what’s going on“. The IPCC is not chartered to know what is going on. It is chartered to perpetuate a meme and make sure that their reports support it. It is tough when you have a conclusion and must search for supporting data. One can almost picture Hansen and friends perform esoteric dances around Vesuvius or Krakatoa hoping the damned volcano will finally pop thus providing the best excuse for wherever temperatures will ever go. Do these people ever hear themselves? So utterly typical. In the short term, the pause will change no minds, or very few minds on the left. The IPCC assures them the models are doing just fine thank you and they will be believed. But ultimately, unless there’s a huge warm up on the horizon that miraculously rescues the models from the trash can, the pause will destroy the AGW movement once and for all. It’s already happening. Australia’s ahead of the pack. And in the U.S., I can easily see a conservative President being elected in 2016. Even if not, voices of reason and moderation like our host are already being increasingly heard. One day soon, the MSM will wake up to the fact that the real story is the malpractice and outright fraud that is responsible for the greatest science mistake in modern history. Speaking as a conservative who has been watching the media since I grew out of my somewhat progressive youth some 35 years ago, don’t hold your breath. The MSM, like progressives everywhere, does not admit being wrong about anything. Maybe I’m dreaming, but I think the thing you’re forgetting is the MSM is above all else, a for profit enterprise. Bottom line is the bottom line. Have a little faith in the purifying flames of capitalism. They’re already going broke at the hands of the Internet. If they come to the realization that this is the story of the century, they’re going to have to write about it. I’d also add that in regard, conservatives are no different. Well, what the “progressives” need is a Great Depression. So far we have only got a Great Recession- and a depression in solidly blue areas [ie, Detroit, though whole state of California is working on it]. You don’t write like a conservative GaryM. I lean more toward liberalism and light government personally and think that you may also be one as well. Maybe you have noticed the inexorable collapse of the MSM as their progressive goals take precedence over their pursuit of profit. And not just print media, the death of which is also being caused by technology. MSNBC, CNN, the major US television networks, all consistently losing readers and viewers as they insult their country, culture and customers. Fox News (which presents conservative views on a par with progressive ones), the Wall Str4eet Journal, are doing quite well. Or look at Hollywood, the MSM’s sleazy sister. Mega blockbuster movies costing $100 million or more are tanking on a regular basis as Hollywood puts its nihilist, anti-American progressive agenda ahead of any profits at all. Progressives are progressives first, and everything else, including journalists, second. As for conservatives never changing their minds, that is just absolutely false. Every conservative I know was formerly more progressive, myself included. And conservatives admit they are wrong whenever there is sufficient evidence to convince them. Margaret Thatcher, Sarah Palin and many other conservatives accepted what was presented as a scientific consensus on “global warming”, until the political agenda of the advocates became clear at Kyooto, Copenhagen, and finally the release of the CAGW manfesto called the SPM of the AR4. You progressives, and former progressives, are blissfully unaware that all the flaws and politicization in the AR4 were the topic of extensive debate when the AR4’s SPM was released. The debates just weren’t taking place in the approved media you all looked to. I am a conservative in the modern usage of that term. Which is really what used to be called classical liberalism. Progressives took the name of “liberal” when the term progressive became a negative as people saw what their po9licies really were – eugenics, centralized government on a proposed global scale, etc. Modern conservatism is often described as a three legged stool – economics (free market capitalism), social (the Judeo-Christian ethic), and foreign policy (strong national defense). Progressives, moderates, independents (particularly those in the U.S. Republican Party) will assign the label as they see fit to advance whatever argument they are making. But this is the only definition that makes sense in the current political environment. Because there is no other label to describe those with such views on all three issues. As to the “light government”, yes, I agree there, but that has never been inconsistent with conservatism. Conservatives have never been “laissez faire” capitalists, which is economic anarchy. We have always accepted a role for government, even on the national level where necessary, for some regulation for health and safety. “Conservative” is not just the boogey man name progressives, moderates and independents assign to those they want to demonize. It is also the name of the political philosophy that made the U.S. the richest, freest, most generous, most just society in the history of the world. Conservatism has lifted more people out of poverty than all the government programs in the history of the planet. Even the Chinese have started to emerge from the economic stone age by adopting some free market principles. (Although it is only a matter of time before they learn they have to choose between a free market, and complete political control. Just like Gorbachev did. What you have to keep in mind about the MSM is that large swaths of it are parts of larger enterprises, and were never expected to be profit centers. The big broadcast networks, ABC, CBS and NBC always produced news to help their affiliate stations keep their FCC licenses. The news was never expected to turn a profit, and never really did. @ Gary “As for conservatives never changing their minds, that is just absolutely false.”. You disappoint me Gary. The notion that conservatives are somehow better people is just a bunch of rot. They’re all people, subject to the same human failings. I can’t believe I have to assert that, that’s it’s not self-evident to you. In any case, you’re misquoting me, or not quoting me at all. I said conservatives are just as bad as liberals. Of course you can find examples of politicians who’ve changed their minds. On both sides. You’re the one who said “never.” Which is manifestly false. All people are weak, and do wrong. The difference is that conservatives value principle over result. The end does not automatically justify the means. Progressives, to the contrary, preach precisely that – Steven Schneider, Saul Alinsky, many others make clear that the end not only justifies the means, but makes it virtually irrelevant. One of progressives’ great PR successes has been creating a conventional wisdom that all ideologies and cultures are equal – multiculturalism. All people are created equal, but the principles of conservatism are vastly superior, and more just, than what passes for principle in progressivism. Elitists choose progressivism because it confirms their belief in their own superiority. People who choose conservatism do so at the cost of their own vanity and personal power. The belief that one is superior to one’s fellow humans is intrinsic to progressivism, and anathema to conservatism. Slavery, genocide, eugenics, objectification of the helpless (abortion and euthanasia), and many more policies are the product of the elitism/statism that is the core of progressivism. The world is full of people who are progressives without understanding or embracing this elitism. They are what I call default progressives. They accept the paens to “fairness” and “for the children” and the “consensus” because that is all they were taught, and almost everyone they know believes the same thing. Their own principles are frequently in conflict with progressive politics. But since progressive misrepresent/obscure their true philosophy and goals with such constancy, they don’t even see the conflict. Hmmm. It seems that your “new” conservatism as defined is really the old laissez faire liberal that I think that I fall into. “Conservatives” in the old sense are resistant to change and accord more with dictionary definitions. I respect people who aren’t afraid to speak truth to power, and who show some integrity. I can name all sorts of people I disagree with, but respect. You most surely are not among them. I disagree vehemently with R.M.’s religious beliefs for just one example, and yet continue to have admiration for the man. Which is to say he apparently believes God protects us from our own mistakes, It’s the same to me, risible position that Rush Limbaugh take WRT to global warming. From Wik. : “McKitrick is a signatory to the Cornwall Alliance’s Evangelical Declaration on Global Warming, which states that “Earth and its ecosystems – created by God’s intelligent design and infinite power and sustained by His faithful providence – are robust, resilient, self-regulating, and self-correcting”. I think that in the beginning there was nothing, then it exploded. Isn’t it amazing what people believe on the smallest slivers of evidence? Doc, pg – I don’t think how the Earth began is of any importance, we need to understand the world in which we live and how to live harmoniously with each other in it. Whether there was a big bang 13 billion years ago or a celestial being providing a finished article much more recently doesn’t change that. It’s funny. The IPCC made predictions of drastic, immediate warming because that was the only way to sell the CAGW policy package to the stupid voters. Now they have to admit that 15 year pauses are “common”. Imagine if the IPCC had shown some humility, let alone honesty, and admitted in 1990, 1995, 2001 or 2007, that they had no idea what the temps would be over the next 10, 15 or 20 years. But no, they had to make scary predictions. That was what their political bosses wanted, and still want. SO that is what they got. For AGW the “pause”, if it exists, is not terribly relevant. For CAGW, it is poison. Translation: We don’t have a clue. We need a real-time ocean heat widget incremented in nanoKelvins. I am sure Pekka and FOMD could knock one out by lunchtime if asked nicely; they know everything. Judith, I’m delighted to see your excellent article in today’s Weekend Australian. It comes across as very logical, sensible and hard to disagree with. The article is well presented, it takes up most of the front page of the broadsheet Inquirer section, which is the best offering of analysis and comment in the Australian media, and 35% of the next page. The pathetic article by John Cook only helps to emphasise the quality of your article by contrast. The Aus also editorialises on the issue, I’ll post that because of the paywall. I hope that my frequent references to you in my letters – either in the body or in supporting info – helped The Australian to invite your article! Judy, I’ve e-mailed the article to you. Wonderful work, Dr Curry, in every thread of the last few days and now I gather (I confess I won’t subscribe) in the Aussie press. Quote of the day indeed. It might have to become quote of the hour if they keep this up. CONSENSUS has its strengths and weaknesses. In politics it can sometimes be a useful model; in other spheres, not so. Until recently it was not a term we associated with science, where the testing of provable facts takes precedence. The fact, for instance, that Nicolaus Copernicus failed to win a public consensus during his lifetime did not alter the reality of his postulations that the Earth was not at the centre of the universe. Likewise, the Earth was a sphere long before the flat Earth consensus dissipated. In that seminal study on such matters, Monty Python’s Life of Brian, the point is clarified. An idolising crowd is told they should not follow Brian as the Messiah, but think for themselves. “You’re all individuals,” Brian tells them. “Yes,” the crowd responds in unison. “We are all individuals.” Then a lone voice pipes up. “I’m not.” In this case, the consensus was wrong; as was the dissenter. The issue of climate change is a significant political, economic and environmental dilemma confronting our nation and the international community. At its heart is science. While we can engage in complex debates about the variety of mechanisms, technologies and practices that can be employed to deal with the issue, none of it makes perfect sense until we grasp the dimensions of the problem. And this is where science is pre-eminent. Yet, thanks largely to the Intergovernmental Panel on Climate Change, the debate has been centred not on scientific claim and counter-claim — or scientific theory and measurable results — but on what’s referred to as the “scientific consensus”. This is almost an oxymoron; to at least some extent, the two words don’t belong in the same sentence. This is not to say we should not act on the best available scientific information in an emerging field of cross-discipline science. But it does mean we need to consider other ways of arriving at the best possible conclusions. Judith Curry makes a powerful case in Inquirer to drop the consensus approach in favour of open debate about uncertainties and interrelated issues. The media could start by reporting the 15-year pause in global warming. Perhaps the public is mature enough to discuss the full range of possible explanations. Perhaps those associated with the axed climate commission, such as David Karoly and Will Steffen, should give it a go. I DON’T think anyone begrudges outgoing climate commission chief Tim Flannery the right to continue working to ensure the public has all the information we need to act appropriately on climate change (“The winds of political change blow away climate bureaucracy”, 20/9). However, it doesn’t seem to have registered with this learned academic that the information he gives us must be accurate if it is to be useful and taken seriously. Flannery’s gloom and doom predictions of water shortage and his calls for billion-dollar desalination plants were so spectacularly wrong and costly to the public purse that they would have caused even John O’Brien’s character, Hanrahan, to blush. WHAT Australia needs is reliable and independent information which the climate commission has been providing since 2011. The scrapping of the commission comes as no surprise from a climate-change agnostic Prime Minister. But a saving of $586,000 this financial year is a saving of a few cents per taxpayer; surely the benefits of the organisation outweigh its modest cost. As a young person, it’s scary to see politicians risking our future for short-term political gain. Normally, young people are those typecast as having no concern for what tomorrow brings, but at the moment we are the ones asking the government to think of the long-term outlook for Australia. Prime Minister Tony Abbott is not just cutting the climate commission, he’s cutting our future. A TRULY worthy acknowledgement of Tim Flannery’s contribution to the economy would be to dedicate his name to each of the country’s mothballed desalination plants. We could add a footnote to indicate the number of hospitals, schools and roads that were foregone to build them. That way, if they save us all in the future, he will be deservedly praised. But if these costly white elephants stand idle for 1000 years, people will quite rightly say these wasteful endowments represent the total sum of Flannery’s finest hours. SINCE its inception, the climate commission has provided independent and rigorously researched information on the causes, effects of, and solutions to, climate change. It has produced compelling reports on renewable energy and Australia’s increasingly extreme weather. The decision to shut it down is a case of shooting the messenger. It is an action that will appear all the more short-sighted when the next report of the Intergovernmental Panel on Climate Change is released. TIM Flannery is quoted saying he intends “to continue working to make sure that the Australian public has all the information it requires in order to engage with this issue and understand what needs to be done”. That will be a welcome change. By 2020, China and India’s increase in carbon emissions is estimated to be 2.8 billion tonnes a year. Perhaps Flannery will explain how the carbon tax, which has a goal to reduce Australia’s carbon emissions by about 4 per cent of China and India’s increases in emissions over the same period, will help solve climate change. AXING the climate commission and sacking Tim Flannery will further label the government as sceptics. So the government must take steps to erase that impression. It should proclaim its acceptance of IPCC climate science and begin to plan its response to climate change. Central to the strategy is that nothing Australia does can affect the climate. We can only act in concert with the world’s emitters. Flannery,s Folly has a nice ring to it! Flannery may have depended on CSIRO’s climate models that predicted increasing drought. David Stockwell showed that the CSIRO’s models had it backwards. So much for >90% confidence! Many aspects of ‘climate change’ are exaggerated, particularly indirect effects and the impact of those effects. But the ‘Pause’ or ‘Hiatus’ is also being exaggerated. Examining NCDC global temperature anomalies versus NOAA GHG index demonstrates that the period since 2001 is not exceptional in terms of the longer trend. There is a cooling trend since 2001, but largely because 2002, 2003, and 2005 were anomalously warmer than trend and 2011 was anomalously cooler than trend. For the MSU era, observations are consistent ( hobgoblins and all ) at the low end with IPCC theory. exactly but don’t expect a lot of folk here to even contemplate such things. Coincidentally NCDC reports the joint warmest August global sea surface temperatures on record. Not even in an El Nino. You mean the pause (or slow down if you prefer) you have been denying for years now? That’s the one you agree is being exaggerated? A bit of warmth in the North Pacific. That is a very odd plot. It is based on 280 ppp [CO2] providing 0.376 W/m2 and 560 ppm 5.453 W/m2. The change between 1960 and 2012 is 1.6 W/m2 for a temperature change of 0.9 degrees (HADCRU4). That plot gives a 2x[CO2] of 2.85 degrees. So the NCDC doesn’t believe in the ‘c’ of cAGW anymore? If that’s what they reported, they may be in error. Low end my bippy. Far below, and getting farther. Will a new wave of this nonsense become known as Hagueism, or Kingism, or just merely Dumbism Continued Beyond All Parody? Sir David asserted that he was better at challenging people on subjects he was unfamiliar with, such as epidemiology, as he was “able to keep some distance from the issue”. There is a problem for Myles Allen and any who would use this quote: The models had to correctly account for the enthalpy sink of the oceans in such a manner as to invalidate the objections of Kreiss and Browning while having enough resolution to determine the near surface anomaly. Though some talk of the temperature, the models do not actually all model Earth. The modelers and IPCC’s use of these models as anomalies underscores a basic problem with the ensemble, the absolute temperature values which impact TOA. As B&K proved, there is a geometric increase in error as the computations go forward. The claim to get around the two problems of an geometric increase in error, and using absolute values of temperature that are not Earth’s, is the argument that the model ensemble got the heat transfer correctly in atmosphere and in the ocean. To now claim there are a number of explanations for hiatus is correct, but it is a strawman. There is not an explanation other than the AR4 models are running too warm or are basically wrong. The recent retreat in face of the hiatus is to resurrect as scientifically correct complaints, complaints that were deemed incorrect because they indicated the models were wrong. It’s just different, not very different. Which is very different from very different. It would certainly be interesting to know what Myles Allen thinks this “difference” is. Or is this a “different” difference that requires no definition, simply because a climate scientist said so?! Seems to me that at the very least – in view of the “alarming” (?!) increase in CO2 in the atmosphere prior to and during this “hiatus” – whatever the “explanation” of choice might be, it could turn out to be a very tough sell for the activists – and the IPCC. It has always been hard to persuade the public that invisible gases could somehow warm the planet, and that they had to make sacrifices to prevent that from happening. So, it seems that after almost four years of stumbling, bumbling, fumbling, stonewalling and obfuscation, under the “leadership” of (the now lame-duck) Pachauri, the IPCC has been on a steady downhill path, and now the chickens are coming home to roost! CONSENSUS decision-making on climate change has oversimplified the problem and how to solve it, and unduly politicised the process, a leading US climate scientist has said. Writing in The Weekend Australian today, Judith Curry, professor and chairwoman of the School of Earth and Atmospheric Sciences at the Georgia Institute of Technology, said the consensus-building process itself could be a source of bias. “A strongly held prior belief can skew the total evidence that is available subsequently in a direction that is favourable to itself,” Professor Curry said. Professor Curry has led debate in the science community about the process of reviewing climate change, including giving testimony before the US house subcommittee on environment this year, remarking on the many large uncertainties in forecasting future climate. Australian climate scientist David Karoly, professor of atmospheric science at the University of Melbourne and a review editor of the Intergovernmental Panel on Climate Change’s fifth assessment report, said he did not believe uncertainty was underplayed in the IPCC assessments. “There is a thorough and comprehensive consideration of uncertainty in the IPCC reports and in their summaries, including estimates of uncertainties through multiple different approaches,” Professor Karoly said. “It has been reported that uncertainty is referred to 42 times in 31 pages in the leaked draft of the summary of the IPCC report to be released at the end of next week. Professor Curry said virtually all climate scientists agreed on the basic physics of what impact increased levels of carbon dioxide in the atmosphere would have on temperature. “If all other things remain equal, more carbon dioxide in the atmosphere will have a warming effect on the planet,” Professor Curry said. “Further, virtually all agree that the planet has warmed over the past century, and that humans have had some impact on the climate. Professor Curry has been involved in lively international debate in the lead-up to the release next week of the IPCC’s fifth update report. Debate has centred on the inability of many climate models to predict accurately actual global temperature changes. She said climate scientists did “not need to be consensual to be authoritative”. “Authority rests in the credibility of the arguments, which must include explicit reflection on uncertainties, ambiguities and areas of ignorance and more openness for dissent,” she said. Professor Curry has recommended that the scientific consensus-seeking process be abandoned in favour of a more traditional review that presents arguments for and against, and discusses the uncertainties. Will Steffen, the executive chairman of the Australian National University’s Climate Change Institute, who was a commissioner on the Climate Commission that was axed on Thursday, said he believed Professor Curry was mounting a “straw man” argument. “The emphasis on consensus is overdone,” Professor Steffen said. “In fact, the IPCC reports do an excellent job of representing uncertainties. The terminology that the IPCC uses — such as ‘virtually certain’, ‘very likely’, ‘likely’ etcetera and the very careful definitions that are attached to them, are an excellent way of communicating the uncertainties around various aspects of climate change, and are a significant improvement over the traditional way of discussing uncertainties in the scientific literature. Simply eliminate the incorrect explanations one at a time. The last one standing will be the correct one. Simple. Speed, perhaps no explanations so far put forward are correct. Much more likely IMHO, greater understanding needed if we are going to make a big deal of alleged CAGW. But I don’t think continuing to fund the present IPCC-linked crew will help. Which explanation will you choose to test last? That sounds about right. The ocean cycle that has been releasing less heat is bound swing back to releasing average amounts and the flat tropospheric temperatures measuring sensible heat will show a rebound. Of course, as Pielke Sr. has correctly pointed out, tropospheric energy as measured by moist ethalpy is not flat over the past 15 years. The energy system of the planet has continued gaining energy over this period, and is is only natural variability and perhaps a bit of negative forcing from some moderate volcanic activity that has masked it. Nah. The ocean cycle that had been releasing more heat is bound to continue trending back to average. = where we’re heading if it can’t &/or won’t be acknowledged that 1+1=2. Bob Tisdale puts this “pause” (can you find it?) in the context of real pauses in history. Well, I have a lot of admiration for Myles Allen’s quote. He says very nearly the same thing in two different ways, so you think he has said two different things. But he is quite clear that they have no idea what is going on. He reiterates it explicitly. If there are a number of different explanations, how many? Say there’s only three, of approximately equal probability. Who is more likely to be right in choosing the right answer – a random number generator or an IPCC computer model? We tried everything we could to ignore ocean currents and far too high climate sensitivity. That is very different from saying: ‘We have no idea what’s going on’. I’m willing to accept that at face value. They know what is going on. They’re simply lying, because what they know is going on doesn’t support their agenda. And the Arctic will “without any doubt” be ice-free in 2013. I guess they have a very good idea but do not dare spelling it.